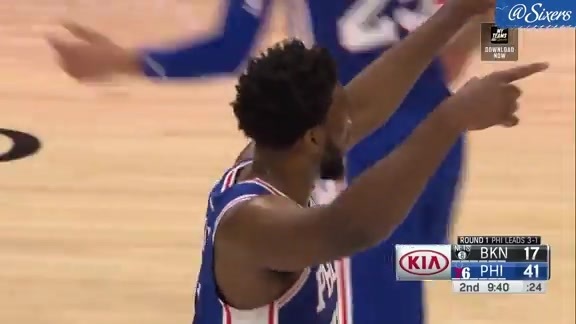 The new look is a good look for the 76ers (36-20), winning their second game in three days with fresh faces in the fold by taking down the Los Angeles Lakers (28-28) Sunday at The Center, 143-120. Fueled by Joel Embiid’s 37 points and 14 boards, the team’s 143 points marked its second highest total this season. Recently-minted Sixer Tobias Harris finished with 22 points, six rebounds, and six assists. He came out hot Sunday, scoring 14 of the team’s first 26 points. “He’s unselfish, he’s efficient, he’s a wonderful teammate,” Brett Brown said. JJ Redick scored 21 points and dropped five dimes, while Jimmy Butler finished with 15 points, four boards, and three assists. Off the bench, T.J. McConnell recorded 13 points, three assists, and three steals, while big man Boban Marjanovic tallied 10 points in his second game as a Sixer. Among the highlights from Sunday’s box score, the Sixers limited their turnovers to a season-low eight, while forcing 16. The team shot 57.7 percent from the field, with 33 assists on 56 field goals. Ben Simmons (8 pts, 3 reb, 7 ast) says that the Sixers’ unselfish spirit will remain key. After trailing by a point at the end of the first quarter, the Sixers outscored the Lakers by at least six points in each of the next three frames. The Sixers have now swept the Lakers in the regular season for the first time since 2005 , coming out on top twice in as many weeks. Los Angeles was led by Kyle Kuzma, who scored 39, while LeBron James collected 18 points, 10 boards, and nine assists. The art of the 4-point play. The Sixers will host the Boston Celtics Tuesday at The Center for the first time this season. The Celtics won the first two meetings between the teams. Boston had won five in a row before dropping its last two games against the Lakers and Los Angeles Clippers. Point man Kyrie Irving leads his team with 23.6 points and 6.9 assists per game, but hurt himself in the Clippers game.